Apparently, people are taking to sites like craigslist and eBay not just to find original Voltron toys from the 80s… but simply to make ends meet (h/t SavvySugar). At Craigslist, which has become a kind of online flea market for the world, the number of for-sale listings has soared 70 percent since last July. In March, the number of listings more than doubled to almost 15 million from the year-ago period. 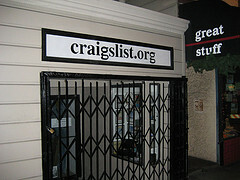 Craigslist CEO Jeff Buckmaster acknowledged the increasing popularity of selling all sort of items on the Web, but said the rate of growth is “moving above the usual trend line.” He said he was amazed at the desperate tone in some ads. I’ve mentioned before that I think ResumeWriters.com sees anecdotal evidence of the health of the economy before anyone else does. Our business saw a surge in client volume beginning last August/September, and hasn’t slackened yet. Yesterday, I sat in and took some customer service calls along with our customer service team. That’s part of the reorganization I meantioned. I wanted to make sure all our systems were still functioning smoothly. I hadn’t answered the phone for ResumeWriters for years, but in the early days of the company I took thousands. So, I’m familiar with the sort of questions people ask and the sort of things people looking for work are concerned about. My second call was from a guy who was saying he was looking for work closer to home because, he “couldn’t afford the commute downtown” anymore. He wanted to move closer into the city but couldn’t because he couldn’t sell his house. So he was looking around for opportunities in his local suburb. Now, I gotta tell you, I’ve NEVER heard that before. So I asked the other customer service team if they had ever encountered clients looking to switch jobs because of gas prices and the length/expense of the commute. Not only had they ALL heard such stories, it seemed to be something not out of the ordinary.